Also from my update of the RobOrchestra website. I apologize for the redundancy. Flutophone is one of the oldest members of the RobOrchestra. It’s seven fingers cover and reveal the seven holes on top of the recorder in order to specify particular notes. Currently Flutophone is in a semi-functioning state. The instrument itself has gone out of tune over time, but it cannot be replaced by any recorder except one with the exact same hole spacing because the fingers are not adjustable. Flutophone’s fingers were originally made of cheap hardboard. After considerable use, the keyway on the hardwood gave out and fingers began to slip. Recently, the fingers have been replaced with laser-cut acrylic and reattached to the original sprockets. The sprockets are turned by servos mounted within the casing. The air flow is controlled by a solenoid valve. The input of the valve is connected to a compressor running at approximately 30psi. The output is connected to the mouthpiece of the recorder, with a latex balloon serving as a buffer to stifle the initial surge in pressure when the airflow is first activated. 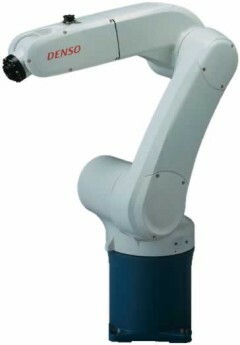 The entire robot is controlled by a single Arduino Duemilanove. It takes in serial commands from a master controller and interprets them as notes with a duration. It then sends a PWM signal to each of the 7 servos to position each of the 7 fingers properly. After a short delay to allow for the fingers to reach their position, it activates the solenoid valve. When the robot is not playing a note, its resting state is with all holes covered. The mechanism we designed on Wednesday was constructed this past weekend. It takes about one hour to manufacture each of the three parts that comprise the gate mechanism. However, it costs less than five dollars to construct a full gate assembly. The assembly turned out just as planned. The only issue that we ran into was that there needed to be a washer between the solenoid mounting plate and the tube in order to keep the solenoid and window lined up. Each of the three parts will need to be machined 30 times to assemble the full Vibratron. The extruded aluminum tube that the balls roll through has an inner diameter of 0.5” and an outer diameter of 1”. In the final version it will be much shorter (roughly three inches long) but for testing purposes a longer tube was used here. On one side of the tube there are a set of holes drilled and tapped for a #6-32 bolt, with a channel milled in between to allow clearance for the solenoid bracket. Orthogonal to those features is a through hole for the tip to enter the tube and a counter-bore on that hole for an o-ring to sit in. The mount connects the tube to the solenoid, and the assembly to the rest of the robot. In this version, instead of an L-bracket like in the rendered design, we used a plate for simplicity. Made from HDPE on a Lathe, the tip blocks the balls from passing through the tube when down. The conical shape prevents the tip from jamming on the top of a ball when closing. The flat end of the tip has a hole for the solenoid to mount in. A perpendicular set of holes connects the tip to the solenoid with a #4-40 bolt. During Sunday’s meeting the team put the mechanism through a variety of tests. The end result was the decision to move ahead with the design and incorporate it into the main Vibratron assembly. Two potentiometers were used to vary the two delays involved with letting a single ball pass through the mechanism. The first delay controls how long the solenoid is powered. During this time, the gate rises up. The second delay controls the minimum amount of time it takes for the spring to return the gate to a closed position after the solenoid is turned off. After considerable testing, it was determined that the perfect amount of time for both parameters is 35ms. This means that it takes 70ms to dispense each ball at maximum speed (obviously you could go slower, effectively increasing the second delay). At this speed, the mechanism can dispense over 14 balls per second! When left on for a significant amount of time (>1 second) the solenoids draw 3 amps at 12 volts. This is a large amount of current. However, when the solenoid is only on for 35 thousandths of a second, the average current draw drops to around .9 amps. With a capacitor in the power circuit to soften initial power spikes when the solenoid is first turned on, the power requirements of the device seem much more reasonable. The final test of the mechanism was to test its durability. The device was run for 1000 consecutive cycles, mostly without any balls in the tube. After the cycles completed, the solenoid was only slightly warm. Because of the low (10%) duty cycle of the solenoid, overheating was a major concern. But after this test, the group is confident that this solenoid can perform adequately. In the initial prototype of the gate mechanism, the plastic tip was bent and mangled after only a few hours of testing. In the new version, the o-ring support the load of the closing gate on the sides instead of the tip. The durability test showed the the tip could maintain its shape even after significant use.